Instead, I present the news aspect. I can tell you what’s new at the restaurant. I can tell you what the flagship dishes are. I can tell you what the eatery looks like or if you should bring your date there, or instead, a group of your rowdy friends. That’s because to me, eating is the one art that everyone can appreciate. You don’t need to have a degree in the culinary arts to decide if a meal was good or bad. You don’t need someone with a Ph.D. to tell you what it means to exit a restaurant wholly satisfied. If you ask me one-on-one, of course I’ll tell you what restaurants I don’t care for — not that you’ll find me writing about them anyway. However, today, I will tell you what international cuisine eateries you can usually find me at come dinnertime in Central Jersey. La Parilla de Manila, at 159 St. Georges Avenue in the Colonia of Woodbridge, started out as a hole-in-the-wall, two-table, two-parking space Filipino fusion eatery in New Brunswick. However, as of August of last year, the eatery has expanded to a full-fledged 84-seat restaurant known for its fair prices and family-run management. 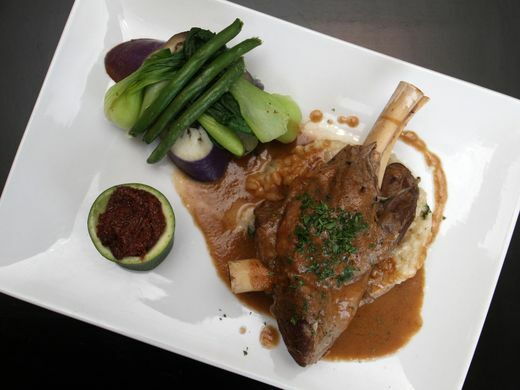 My favorite item, which is also one of the most popular meals at the restaurant, is the lamb shank kare-kare style for $21.99 that features slowly braised lamb and risotto alongside eggplant and string beans and accompanied by bok choi with peanut sauce. 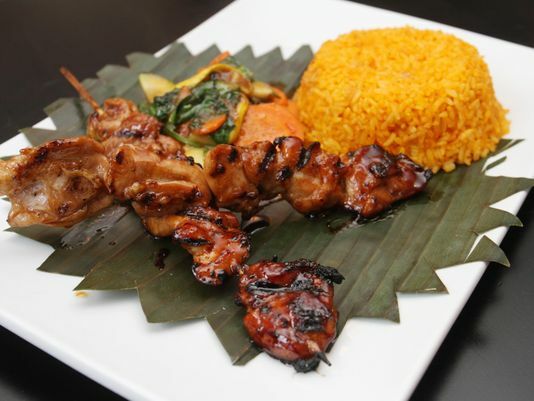 I also love La Parilla de Manila for an upscale lunch with a low price tag — try the chicken barbeque combo for $8.99 that is served with java rice and stir-fried vegetables. Technically, Kumo Asian Bistro, at 69 W. Main St. in Somerville, also serves Thai and Chinese, but since you can pretty much always find me at the sushi bar, which serves all-you-can-eat quality sushi for $13.95 at lunchtime as well as at dinnertime for $20.95 to $22.95, I will refer to it as my favorite Japanese eatery — I’m here about once a week either eating dinner or picking up two rolls to go for lunch. Steve, one of the sushi chefs, is ever-chatty and is he and his team dish up quality sushi and sashimi with fresh fish for an obscenely low price. 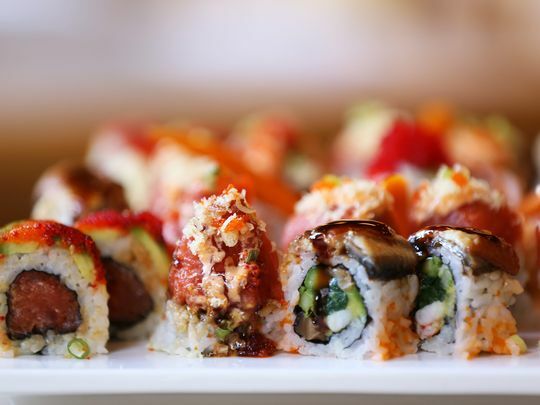 Some of my usual go-to rolls tend to be the crazy dragon roll with spicy crunchy tuna inside and topped with eel and avocado or the sunflower roll with spicy lobster, tuna, salmon, avocado and mango and wrapped in soy bean paper. Formerly in this space, Terrazza Restaurant, at 273 High St. in Perth Amboy, lived as a happening bar. As of April, it became co-owned under a new partnership with Jay Lopez, also owner of A Little Bit of Cuba Dos in Freehold, who has transformed it into a seductive, upscale Cuban restaurant with floral murals, black velvet booths and black and white Havana-esque tile under the new name La Terrazza Cubana. My absolute favorite dish at this authentic Cuban eatery — only fitting since Lopez was born and raised in Pinar del Río — is the lechón asado tradicional, the restaurant’s signature, slow-roasted pork with a secret blend of herbs and spices for $27. Only available in a limited quantity each day, this dish was also featured on Good Day New York. 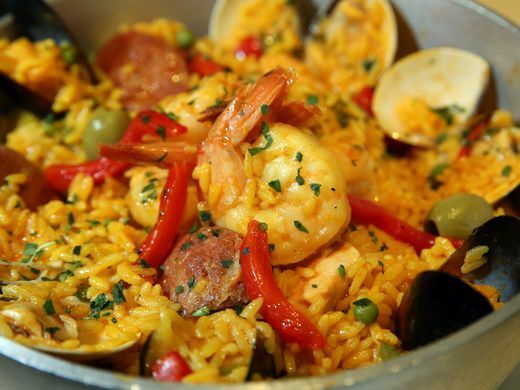 I also love the paella cubana, a dish that will last you for at least a few meals that includes shrimp, scallops, mussels, clams, chicken, Spanish chorizo, peas, peppers, olives, spices and saffron rice for $27. Although you won’t find an owner named Vinnie at Uncle Vinnie’s Clam Bar, at 5 E. Somerset St. in Raritan Borough, you are sure to meet owner Louie if you make your way to the bustling 50-seat restaurant — you’ll know it’s him because he will know every regular guest by name and will have a big smile on his face. This warm, welcoming feeling that you’ll get from Louie ruminates throughout the entire eatery, which has been serving seafood with an Italian slant to the community since 1989. 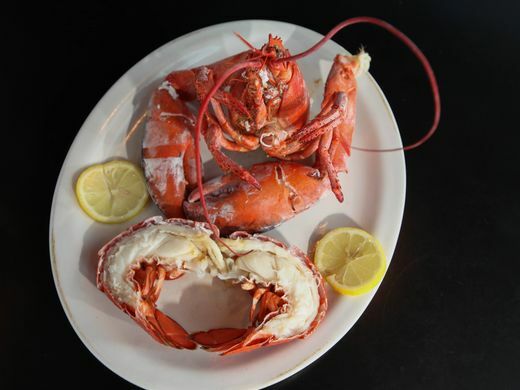 Every night of the week, you’ll find fresh-from-the-boat seafood embellished as varying seasonal specials. Currently, I go for the stone crab claws chilled and cracked and served with honey mustard sauce (market price) to start or the clams oreganata for $13.75 per dozen, followed by the pan-seared sea scallops served over a tricolor salad and tossed with strawberries, feta cheese and house balsamic vinaigrette (market price) or the salmon in white wine garlic and oil sauce with white cap mushrooms, sundried tomatoes and sautéed spinach (market price). Don’t let Kimchi Hana’s half-lit “SUSHI” sign on the corner of the Burlington Coat Factory strip mall fool you — this Korean barbecue eatery, at 6101 Hadley Road in South Plainfield, is usually filled with customers, most of whom are Korean, eating marinated meats cooked over an open char broiler on their individual tables. 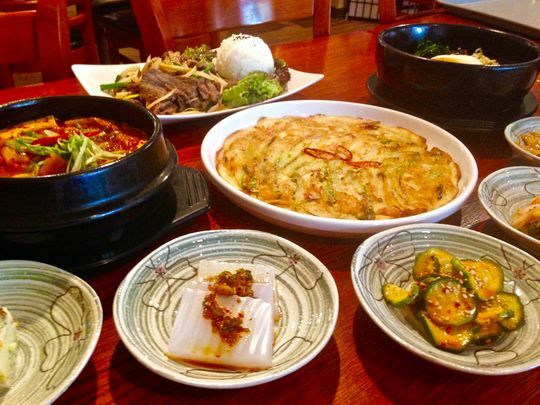 Although there are lots of options for Korean entrees at Kimchi Hana such as seafood hot pots full of cod and vegetables as well as rice bowls and noodle dishes, my usual go-to — which can be said for most of Kimchi Hana’s customers — is the Korean barbecue. For two people, we usually choose to two three meats — favorites being the wang kal bi (marinated beef short rib) and beef tongue — which range from about $25 to $33 each. These meats are accompanied by lettuce wraps and 10-plus plates of traditional side dishes including kimchi, or fermented and seasoned vegetables. 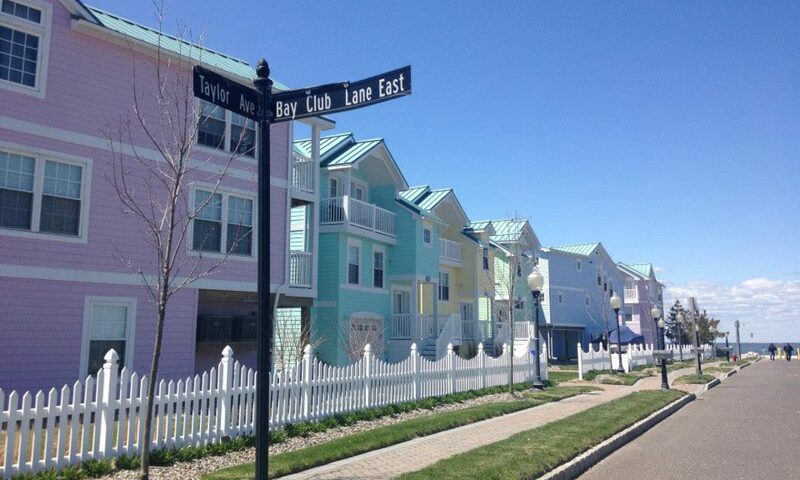 Got a favorite international eatery? Comment below and tell me about it.